For Chickens: Control of infectious synovitis caused by Mycoplasma synoviae, control of fowl cholera caused by Pasteurella multocida susceptible to oxytetracycline. Feed continuously for 7-14 days. RESIDUE WARNING: AT 500 G/TON LEVEL, WITHDRAW 24 HOURS BEFORE SLAUGHTER. ZERO-DAY WITHDRAWAL PERIOD FOR LOWER USE LEVELS. IN LOW CALCIUM FEEDS WITHDRAW 3 DAYS BEFORE SLAUGHTER. DO NOT FEED TO CHICKENS PRODUCING EGGS FOR HUMAN CONSUMPTION. For Chickens: Control of chronic respiratory disease (CRD) and air sac infection caused by Mycoplasma gallisepticum and Escherichia coli susceptible to oxytetracycline. Feed continuously for 7-14 days. For Turkeys: Control of hexamitiasis caused by Hexamita meleagridis susceptible to oxytetracycline. Feed continuously for 7-14 days. RESIDUE WARNING: AT 200 G/TON USE LEVEL OR HIGHER, WITHDRAW 5 DAYS BEFORE SLAUGHTER. ZERO-DAY WITHDRAWAL PERIOD AT 100G/TON USE LEVEL. DO NOT FEED TO TURKEYS PRODUCING EGGS FOR HUMAN CONSUMPTION. For Turkeys: Control of infectious synovitis caused by Mycoplasma synoviae susceptible to oxytetracycline. Feed continuously for 7-14 days. 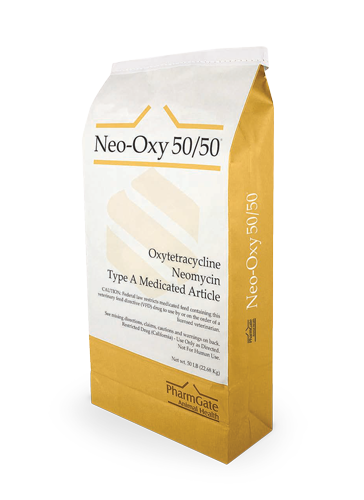 For Turkeys: Control of complicating bacterial organisms associated with bluecomb (transmissible enteritis, coronaviral enteritis) susceptible to oxytetracycline. Feed continuously for 7-14 days. For Sheep: Treatment of bacterial enteritis caused by Escherichia coli and bacterial pneumonia caused by Pasteurella multocida susceptible to oxytetracycline; treatment and control of colibacillosis (bacterial enteritis) caused by Escherichia coli susceptible to neomycin. Feed continuously for 7-14 days. Treatment should continue 24 to 48 hours beyond remission of disease symptoms. RESIDUE WARNING: WITHDRAW 5 DAYS BEFORE SLAUGHTER AT 10 MG/LB DOSAGE. For Swine: Treatment of bacterial enteritis caused by Escherichia coli and Salmonella choleraesuis and treatment of bacterial pneumonia caused by Pasteurella multocida susceptible to oxytetracycline; treatment and control of colibacillosis (bacterial enteritis) caused by Escherichia coli susceptible to neomycin. Feed continuously for 7-14 days. For Breeding Swine: Control and treatment of leptospirosis (reducing the incidence of abortion and shedding of leptospirae) caused by Leptospira pomona susceptible to oxytetracycline. Feed continuously for not more than 14 days. For Calves (up to 250 lbs. ): Treatment of bacterial enteritis caused by Escherichia coli susceptible to oxytetracycline; treatment and control of colibacillosis (bacterial enteritis) caused by Escherichia coli susceptible to neomycin. Feed continuously for 7 to 14 days in starter feed. Treatment should continue 24 to 48 hours beyond remission of disease symptoms. RESIDUE WARNING: AT 0.5-2.0 G/HEAD/DAY AND 10 MG/LB DOSAGES: A WITHDRAWAL PERIOD HAS NOT BEEN ESTABLISHED FOR USE IN PRE-RUMINATING CALVES. DO NOT USE IN CALVES TO BE PROCESSED FOR VEAL. AT 0.5-2.0 G/HEAD/DAY AND 10 MG/LB DOSAGES: A MILK DISCARD TIME HAS NOT BEEN ESTABLISHED FOR USE IN LACTATING DAIRY CATTLE. DO NOT USE IN FEMALE DAIRY CATTLE 20 MONTHS OF AGE OR OLDER. AT 10 MG/LB DOSAGE, WITHDRAW 5 DAYS BEFORE SLAUGHTER. USE OF MORE THAN ONE PRODUCT CONTAINING NEOMYCIN OR FAILURE TO FOLLOW WITHDRAWAL TIMES MAY RESULT IN ILLEGAL DRUG RESIDUES. For Growing Cattle (over 400 lbs. ): Reduction of the incidence of liver abscesses. Feed continuously. For Growing Cattle (over 400 lbs. ): Treatment of bacterial enteritis caused by Escherichia coli and bacterial pneumonia (shipping fever complex) caused by Pasteurella multocida susceptible to oxytetracycline; treatment and control of colibacillosis (bacterial enteritis) caused by Escherichia coli susceptible to neomycin. Feed continuously for 7-14 days in feed. Treatment should continue 24 to 48 hours beyond remission of disease symptoms. 0-5 days for turkeys and cattle. Ingredients: Oxytetracycline dihydrate, neomycin sulfate, calcium carbonate, roughage products, mineral oil.